Despite not being there in person, Iranian director Asghar Farhadi won big at Sunday night’s Oscars, taking home Best Foreign Language Film for his movie The Salesman. 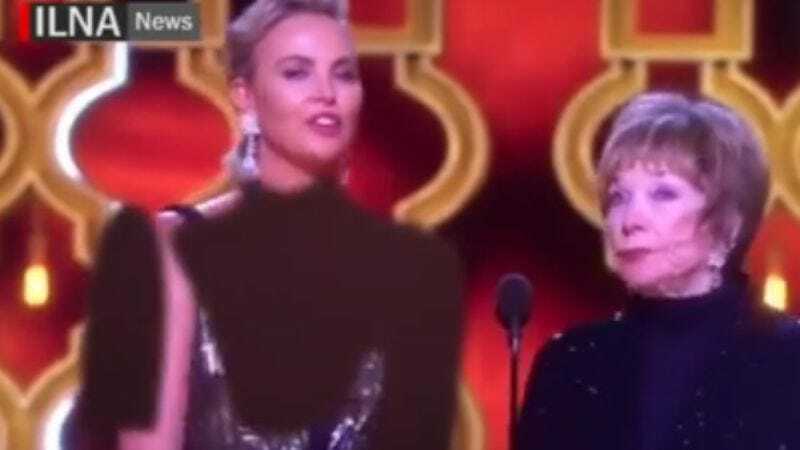 Farhadi’s victory was broadcast on Iranian TV, but not without a few alterations; according to The Hollywood Reporter, at least one outlet decided that presenter Charlize Theron’s Oscars dress needed some touch-ups before it could be broadcast to the people. But the digital wizards at the Iranian Labour News Agency didn’t content themselves with a mere blurring of Theron’s body; instead, someone at the state-run agency attempted to take advantage of the relative immobility of Oscar presenters to add their own flair to her outfit, filling in long black “sleeves” and a high neckline with what looked like the black spray paint tool from MS Paint. The effect was…less than convincing, especially when Theron—presenting with Shirley MacLaine—abruptly moved, forcing her “dress” to trail a few seconds behind her. As displayed in a video by Facebook’s My Stealthy Freedom, the censor team at ILNA later reverted to a simple censorship bar for Theron’s body. But they got a little creative again when Iranian-American engineer Anousheh Ansari took the stage to accept the award on Farhadi’s behalf. (The director boycotted the ceremony in protest of the policies of President Donald Trump.) Rather than editing out all of Ansari’s pretty modest dress, they simply filled in one exposed bit of skin with blurring, resisting the urge to add some earrings or a new pattern of their own devising to her ensemble as they did.